HART is requesting $10,000,000 from the U.S. DOT in TIGER discretionary funds for the Marion Street Transitway Rehabilitation and Enhancement Project. This project will enhance the ‘livability’ of the Transitway for all modes of transportation for the continued growth of Downtown Tampa. Stop Consolidation and Spacing. By reducing the total number of stops and spacing stops to allow buses to pass, bus speeds can increase, and passenger amenities can be concentrated in fewer locations. Stop Assignment and Ticket Vending to speed up boarding and improve passenger access to the system. New, more transparent and well-lit shelters, with a full complement of passenger amenities and information to provide greater levels of comfort and a stronger sense of safety and security. 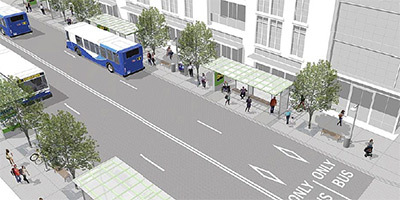 New Streetscapes, including upgraded sidewalks, better lighting, enhanced landscaping, and fixing pavement deficiencies, so that both transit patrons and pedestrians can enjoy a quality environment and improved north-south connections through the heart of downtown. This goal is to maximize service, attract higher levels of ridership, serve new transit markets, improve the transit patrons’ experience, and contribute to the continued revitalization and regeneration of Tampa’s urban core. The federal funds will be matched with local funds In the amount of $2,500,000 bringing the total project cost to $12,500,000. For more information, contact HART Public Information Officer Sandra Morrison at 813.384.6610.